Going viral on social media is all about getting people to care about what you’re posting. There are several factors that must be in place such as using the correct platform for your business and audience, attracting the right audience for your products, posting at appropriate times, etc. But those are fairly easy to figure out. When was the last time you saw a post like this in your personal feed and shared it to your timeline? The scarf is beautiful and it’s actually a great photo…it’s just not a great photo for a social media post that has the potential to go viral. 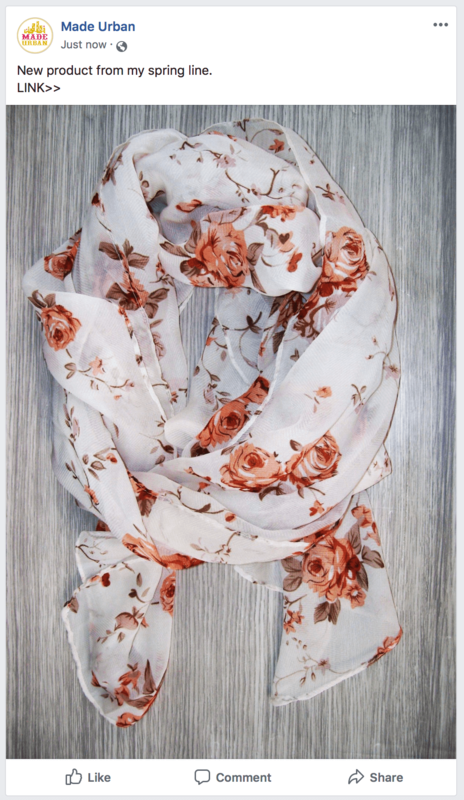 Who is this scarf perfect for? Can you instantly imagine how you’d wear it and what type of occasion you’d wear it for? And feel so excited about that outfit you want to buy now? Do you feel compelled to pay for shipping on this scarf or would you just try and find something similar at a local department store? If it’s a struggle to come up with any of these answers, people aren’t going to pay much attention to your social media posts. It has to be easy for your followers to understand why they should care about the product you’re posting. Unfortunately, most products aren’t interesting enough on their own to show a picture of them, not in use, on a plain background, and get people to stop scrolling, read the caption and share, comment, tag, or click through to buy. You have to create a story around your product. Tag their friend “Sara” because the item is perfect for her. Share it on their timeline because it’s exactly what they’ve been asking for and they want their husband or friend to know (birthday gift…hint, hint). Click the link and buy now because they know exactly how and where they’ll wear it or that it’ll be hard to find something that fits their style so perfectly if they don’t grab it now. We look for specific products when we’re shopping because we have a specific style or specific preferences. Colors – it needs to work with the colors I already have in my wardrobe. Patterns – I’m not a big plaid person but I love a feminine floral…but not any floral…I’d never wear something with sunflowers or daisies; more like of a peonies. Style – I like longer, wider scarves that can be looped around; short skinny chiffon scarves to be tied around the neck 1950’s style just isn’t my thing. So the first step is to know who you’re specifically speaking to with your social media post and show them your products are the perfect match for them. If I were to improve the example social media post with this step alone, I would add a model who represents my ideal customer; their age, hair color, and style. I’d put effort into choosing the perfect outfit, hairstyle, and accessories to wear the scarf with, and photograph the model in an appropriate setting. Sure, the backyard may be a convenient place to have a photo session, but how many of us get dressed up and put on a beautiful scarf to sit in our backyard by ourselves? Maybe I’d style the scarf on a woman in her mid-thirties, with blonde hair pulled into a low messy bun, wearing a straw fedora, moss-green tank, gold accessories, aviator sunglasses, and have her sitting on a patio with friends, sipping a glass of wine. It does take this level of effort to get product shots that garner attention. Your photos must rise above the effort competitors are putting in, and most are snapping photos the easy way. You can also get several shots during this one photoshoot, to be used over and over in social media posts, website photos, product listing photos, lookbooks, postcards, etc. If you think back to anything you’ve ever liked, shared, tagged or commented on in the past, it evoked an emotion. Think about which emotion you want to evoke through your post. Obviously, we want to tie that emotion to your products in some way, so think about the purpose of your products or business. Do they solve a problem? Anger, sadness, stress, worry, or fear are often evoked when we have a problem we need solved. I don’t like the idea of making someone scared in order to sell a product, but rather pointing out the issue they may be dealing with, letting them know they’re not alone, and then making them feel hopeful about the solution you have. There are some products that have an obvious solution to a problem, but for everyday items such as accessories, it can be harder to uncover a legitimate problem. However, earrings do not solve the problem of “not having earrings to wear”. It’s not a legitimate problem one business’ products solve because every earring on the market solves that problem. If your products do indeed solve a problem, what is the emotion you want to tie to it? How will you evoke that emotion through images and text? Do they fulfill a desire? When there isn’t an obvious solution your products solve, consider if they help customers fulfill a desire. If your products appeal to a desire, consider the emotion tied to that desire and how you can evoke that through images and text. Do they appeal to a passion? Passion can make someone feel excited or full of love. Someone who’s into trendsetting fashion will get excited when they see a new trend come out and start dreaming up ways they can wear it and where they’ll wear it. Someone who’s passionate about traveling will get excited when they see a picture of a landmark they’ve visited and recall the memories from that trip. Someone who’s passionate about improving their health and cleaning up their lifestyle will feel excited about the potential changes they might see when they start eating a new health food, stop using irritating household cleaners, or replace their harsh face wash with an all-natural, organic one. Someone who’s passionate about cats will be filled with love when they think about their cat and how much fun it will be to see them play with their new toy or get a new treat. If your products appeal to a passion, what do your ideal customers feel when they think about that passion? How can you communicate that feeling through images and text? Do they change someone’s perspective? TOMS is a great example of this. They do indeed solve the problem of putting shoes on the feet of children in need (you buy a pair of shoes and they donate a pair to a child). However, the average consumer in North America isn’t up at night thinking about how to get shoes to children in need. It’s not a problem they need solved. Instead of appealing to a problem the consumer has, they appealed to the consumer’s compassion and helped change their perspective on how they spend their money. Although your consumers may not currently be passionate about a subject or have the desire to change something, your marketing may help them do so. Help the average Joe understand art or realize how important art is to the feel of a room and our mood. Make consumers realize what goes on your skin goes into your body, or how harsh chemicals from big brand soaps are impacting our water supply as the runoff from washing our hands or shampooing our hair goes down our drains. Show pet owners the importance of pet bonding time and how pet companionship can be a health benefit to humans and animals. Or maybe you want to change consumers’ perspectives on how they shop for a certain product. Dollar Shave Club and Basic Outfitters have done this. Razors are expensive and are typically purchased at the grocery or drugstore. Dollar Shave Club delivers razors right to your door on a monthly basis so you never have to remember to add “razors” to your grocery list again. Shopping for socks and underwear isn’t exactly an exciting task and it’s one that tends to be put off and require a trip to the department store. Basic Outfitters allows you to quickly and easily pick out a drawer full of quality basics at a low price and have them delivered to your door. Are you hoping to get your customers to look at something in a different way? What’s the emotion you want to evoke so they feel the need to change? And how can you evoke that emotion through images and text? You’ve uncovered the emotion you want to evoke and the problem, desire, passion, or perspective you want to point out. Now we need to tie it back to your products so you’re not just riling people up on social media or having people think “that’s nice” and then going about their day. If you’ve evoked anger by pointing out a problem, tell followers how to relieve that anger and solve their problem through the use of your products. If you’ve posted an amazing photo of a model wearing your new earrings and got your followers excited and having the desire to look trendy, link to the products seen in the photo and tell them how they can get the same look. If you’ve gotten followers feeling the love for cats through an adorable video of your fluffy feline playing with a toy, where can other cat owners find a similar toy and how can they make playtime more enjoyable? 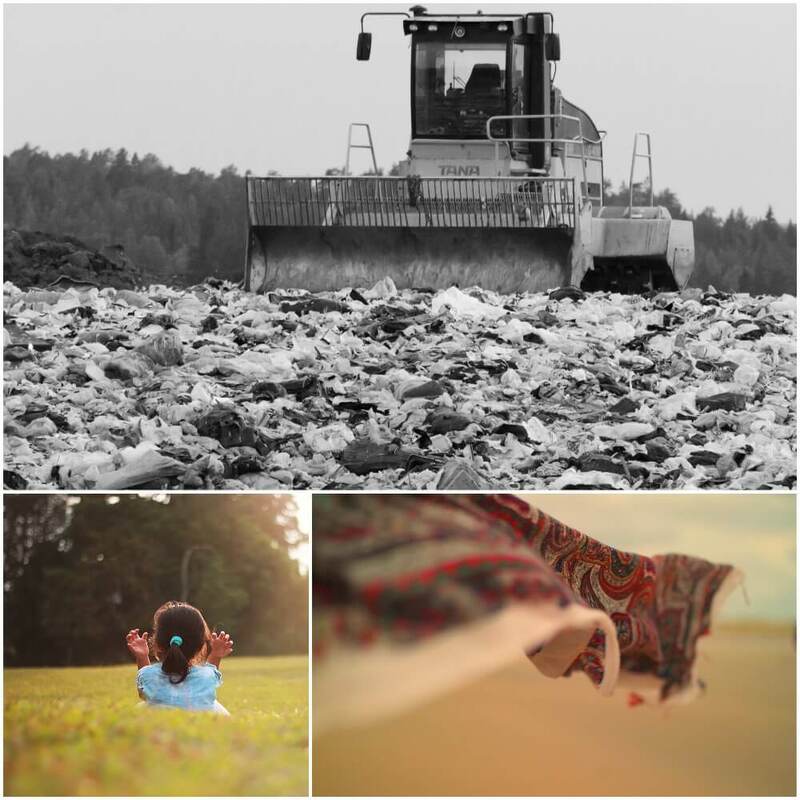 If you’ve evoked sadness or compassion by showing a photo of a disgusting landfill, sharing how many billions of pounds of fashion items fill our landfills each year, and opened their eyes to a new perspective when it comes to the downside of shopping at H&M, where should they shop instead? What’s your plan to get them to their destination? They want to look trendier; how can you help? They want to do their part to help reduce waste; what’s the first step? Briefly and clearly explain how you can help solve their problem, fulfill a desire, build on their passion, or act in-line with their new perspective. 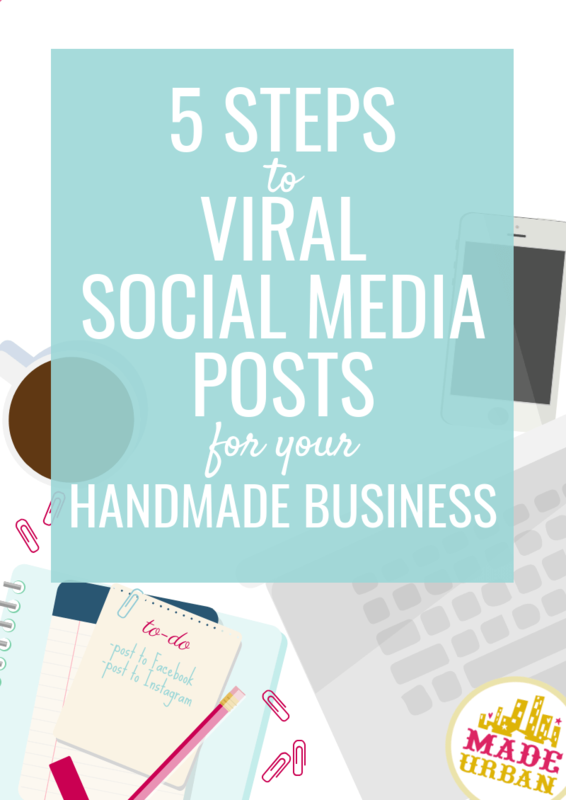 The chances of a post going viral or getting more eyes on it go up as it becomes more purposeful. Is it simply a nice photo to look at? It might get a like. Still great though; the more likes a post gets the more it’s shown in other people’s feeds. Is it something that will give the person who shares it some type of credit? (E.g. hey look at what I discovered) People like being the first one to know about a cool product or to tell friends about a catchy song or addicting TV show. Keep that in mind when posting. Are you telling them about a new trend, an ingredient they should stay away from, or a why-didn’t-I-think-of-that type tip? Will other people’s lives improve because of the post? Will it help people who don’t follow you have a laugh, learn something new, etc.? Your followers may tag friends in the comments if they think the information you’ve provided is valuable to more than just them. For example, the post with a model wearing a pair of earrings may also share how to get the look: how the makeup or hair was done, where to buy other clothing and accessories shown in the photo, or how and where to wear the look (styling tips). Is it more than just a post? Is there an article you can link to that offers more information? A set of instructions they can follow to achieve something? A free download? It’s even more likely that post will be shared. Consider how you can add value to your post and be more than a pretty picture to look at or clever words to read. Although it may seem obvious to you, social media followers should be told which action you want them to take. This is called a call to action (CTA). What do you want them to do next? Stick to one CTA per post and make it clear. 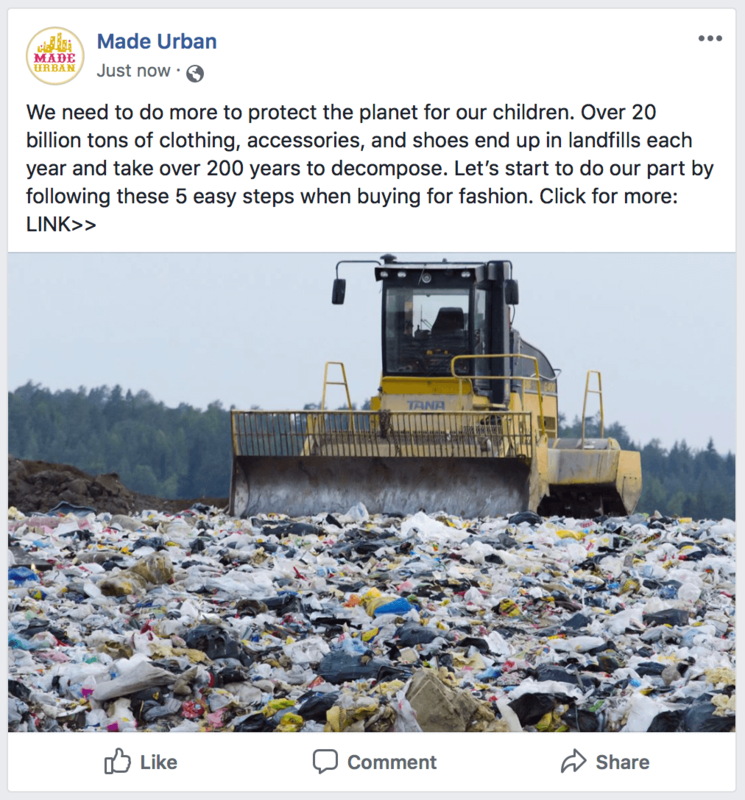 Let’s take a look at that scarf post from the beginning of the article and how I might tweak it using these 5 steps, to increase its chances of getting more engagement or going viral. We’ll say I’m targeting a woman in her late 30’s, who has children and a sophisticated, classic sense of style. I want to evoke a bit of shock and anger to help her gain a new perspective on the way she buys clothing and accessories. I’ll share easy steps to help her act on this new perspective and a better way to shop. I’ll link to an article that expands on how she can change the way she shops. The purpose of this post will be to drive people to my blog to read the article. There will be product links and photos within the article, as well as a prompt to sign up for my newsletter. Your turn! What type of social media post are you going to create using the steps in this article? Perfect timing! I am in the process of getting ready for a launch and creating my pictures and life style shots.. it’s hard! I so want to wimp out and just do product pictures and be done. Ok…. I’m going back to the drawing board. Thank you Erin for your wonderful info you always give! This is the best article I’ve seen on what to post on social media! Thank you for putting it so clearly! !